When last we visited @CharisseCase916 she was in Day 1A, picked up Aces and had them cracked by a set to end her day in that flight. 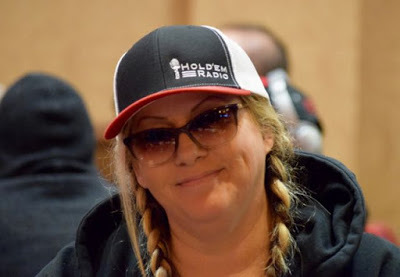 She enters Day 1B and heads out to the hotel lobby to get play started there. She likes what she sees on the 2-5-8, two-club flop for she's holding pocket Fives for middle set. Case likes it more when she opens, there's a 3-bet and a shove all-in. Off she goes with her chips in the middle and the third player does as well. Sure, there's a flush draw all-in, but the third player is holding pocket Eights for top set. The flush draw gets there by the river, but it pairs the board so it is Boat-over-Boat-over-Flush. First, Case falls to a set, now her set runs in to a better set.